I’m a big fan of one pot meals, charmed by the appeal of less clean up and less fuss. I’m also quite partial to recipes that use up impractically small handfuls of leftover vegetables in my produce drawer. This recipe does both. Is both. You know what I mean. 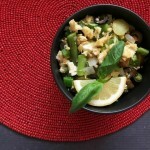 I’ve been making this Greek Tofu Scramble for years, but never really had a formal recipe…until now. It comes together pretty fast for a main dish, and you can pair it with fruit, some yummy bread, and/or a salad to make a full meal. It’s quite versatile, too; see the ingredient notes below for variations on the basic scramble method. We usually have this for a one pot dinner, but it would make a great breakfast or brunch dish too. Makes 7 cups or 4 servings of 1¾ cup each. While vegetables are steaming, heat 1 tablespoon oil in a large skillet over medium to medium-high heat (setting of 6 out of 10 on my stove). Crumble tofu into the skillet, breaking into pieces between thumb and fingers. Cook until browned, about 9-10 minutes. Break up any big chunks with your spoon or spatula. Remove from skillet. Return skillet to the stove. Heat remaining 1 tablespoon olive oil and add onions. Cook for 3 minutes or until beginning to soften. Add green pepper and cook an additional 1-2 minutes. Add remaining ingredients and browned tofu and cook for another 3-4 minutes or until heated through. I suppose one could argue that this isn't truly a one pot meal, since you have to steam the potatoes and green beans first. But I still fondly think of it that way since the recipe essentially comes together in one large skillet where you dump everything and stir. Tofu: My all-time favorite brand is Wildwood Organic High Protein Tofu Super Firm, but to test this recipe I used House Foods Organic Firm Tofu from Costco. I just couldn’t pass up the 4 tubs for $5.69 price. I nearly always freeze my tofu before I cook with it, for two reasons. First, if I buy a lot at once, it makes sense to let the extras hang out in the deep freeze until I’m ready to use them. Also, I find that the freeze and thaw process makes for a “meatier” texture, which I like. I’m usually in a hurry when I’m cooking dinner, so I don’t have patience or forethought for the whole “draining tofu with weighted plates” ordeal. My typical MO is to microwave the block for 4-5 minutes to thaw it out, then wrap in paper towels and give it a couple of good squeezes to get rid of the extra moisture. Olives: If this was truly an authentic Greek dish, I think it would call for dark purple Kalamata olives. But, I prefer the taste of the standard black. Feel free to choose your favorite; maybe even go crazy and experiment with some of the fancy brown or green ones from the olive bar at the grocery store! Cheese: I have made this recipe with lemon-garlic-oregano flavored feta cheese, but I couldn’t find that particular product at the store this time around so I just went with the plain stuff. I think it would boost the overall flavor (and Greekness) a bit if you can get some. 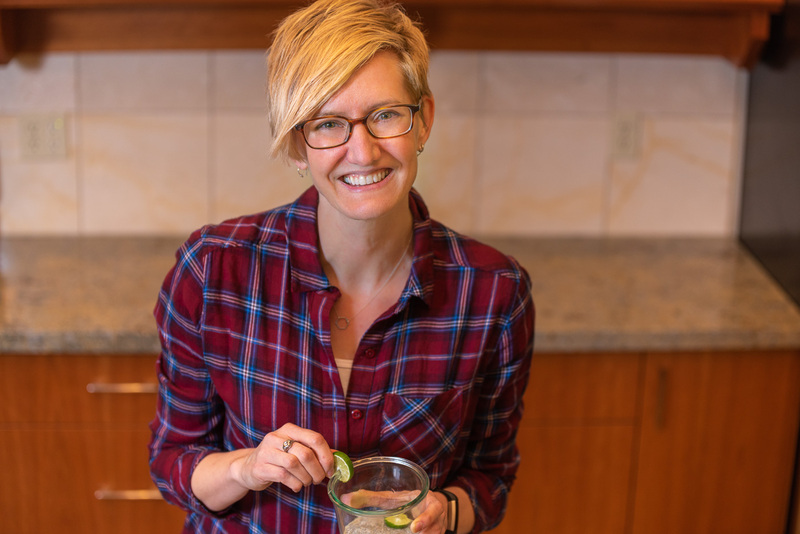 Vegetables: I feel sure you could improvise with this recipe and substitute whatever impractically small bits of vegetables are languishing in your produce drawer. In the spring I often use asparagus in place of one of the other veggies. 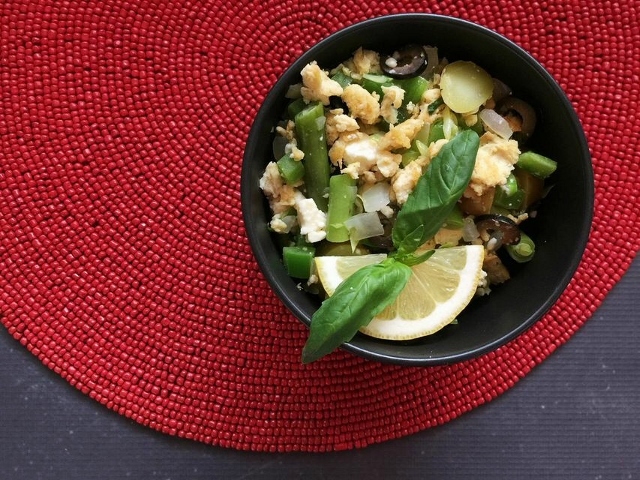 Turns out this scramble is pretty low in calories, with 13 g protein per serving, and it could be made vegan without the cheese. It also does pretty well in the mineral and vitamin department with 20% of the Daily Value for iron, 30% for calcium, and 90% for vitamin C.
Do you have a favorite meal that comes together in one skillet?